(Newser) – The White House has unveiled the crackdown on asylum seekers President Trump promised last week. A joint statement from Acting Attorney General Matthew Whitaker and Homeland Security Secretary Kirstjen Nielsen released Thursday announced an "Interim Final Rule" declaring that "aliens" who violate presidential suspensions or limitations on entry via the border with Mexico will be "rendered ineligible for asylum," the BBC reports. "Today, we are using the authority granted to us by Congress to bar aliens who violate a presidential suspension of entry or other restriction from asylum eligibility," the statement said. It said the system is "overwhelmed with too many meritless asylum claims." I immigrated - legally - from Britain. It cost me a fortune in legal fees despite having university degrees in practical subjects. If you're a foreigner and want to live here pay your dues just like I - and all the other legal immigrants - had to. The law on asylum (a domestic law by the way, which puts us in compliance with international treaties) is pretty clear on who can apply for asylum (people can apply once they are physically within a country, no matter how they entered - though to be fair, Europe and Australia and others routinely violate it too). 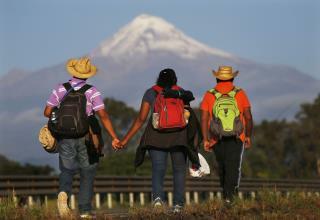 If we want to comply with the law, what we need is to greatly increase the number of asylum judges near the border, so that the preliminary determination can be made quickly and people can be send back (about 75% of those claiming asylum are usually denied immediately, with the rest given a court date for a later hearing - during which time they wear electronic monitoring devices). Too many people without credible asylum cases are indeed asking for asylum and jamming up the system. So we can either increase capacity in the system, or be in violation of the law. Perhaps we do need to change the law, but that is the job of Congress - the President can't just unilaterally not comply. Originally the asylum laws, which came into existence after right WWII, were intended to protect those fleeing war and other disasters where life was in immediate danger. If they crossed a border, the country had no right to send them back. However, it was not intended for people to pass through a bunch of safe countries, in order to claim asylum in the most wealthy one they could reach. So yes, probably time to change the law - but in a constitutional way.